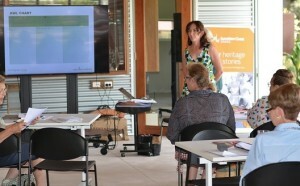 It was ‘roll up your sleeves’ for workshop participants at Bankfoot House, Sunshine Coast, as they learnt how to create engaging education programs for their museums. Cath Gordon from Education Creations and myself teamed up to develop and present a workshop where attendees got to test out their skills in developing activities relevant for their own museums. 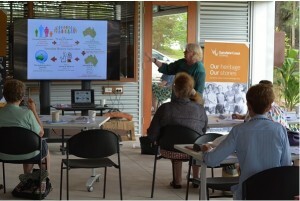 The workshop included the latest Australian curriculum changes that combine History, Geography, Civics and Citizenship, Economics and Business into ‘Humanities and Social Sciences’ for primary schools. In terms of content and approaches for the museums, the changes don’t appear to be too great, and perhaps offer up more areas for tapping the learning potential of collections, through the combining of humanities, although themes for each year level have become a little less intuitive. Workshop participants really enjoyed the hands-on nature of this workshop. The activities helped participants understand the curriculum structure, and working with curriculum documents. There were opportunities to analyse museum activities into the key elements, and to work through developing ideas for activities specific to their museum. Community museums have so much to offer here because the personal connections to the collections. That passion can really inspire students – and all visitors. Catherine and I plan to run more of of these workshops in 2016. Please contact us if you are interested: email info@edprogramdesign, or contact Janis on 0412615483, or Catherine on 0410008030. We thank the Sunshine Coast Council Heritage Unit for providing the opportunity to deliver this workshop to their community museums – and for the enthusiasm of the participants. 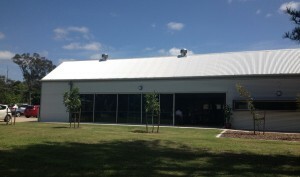 the new facility at Bankfoot House is an excellent workshop venue.